West Ham fell to Burnley today in the most embarrassing match in London Stadium history. Goals by Ashley Barnes and two by Chris Wood in the second half came amidst chaos and stupidity from a few of the home side supporters, as play was repeatedly interrupted by fans rushing onto the pitch, the owner’s box was surrounded by a mob, and referee Lee Mason gave no stoppage time to end the spectacle and clear the pitch. The match began in promising fashion for the Hammers. The first half really saw the hosts having the most opportunities. An early Aaron Cresswell cross struck Aaron Lennon’s arm in the area, but pleas for a penalty were not heeded. Later in the half, Ogbonna headed a ball through to Manual Lanzini, but his one-on-one strike was blocked by the left foot of Nick Pope. For the opening half the Hammers had three shots on targets while Burnley had none. But the Clarets have shown tenacious defending in the first half all season long; surrendering only eight Premier League first half goals. Midway through the second half, Sean Dyche brought on Chris Wood as a second forward and that seemed to baffle West Ham’s three central defenders. An Ashley Barnes goal in the 66th was met with fans rushing the pitch. 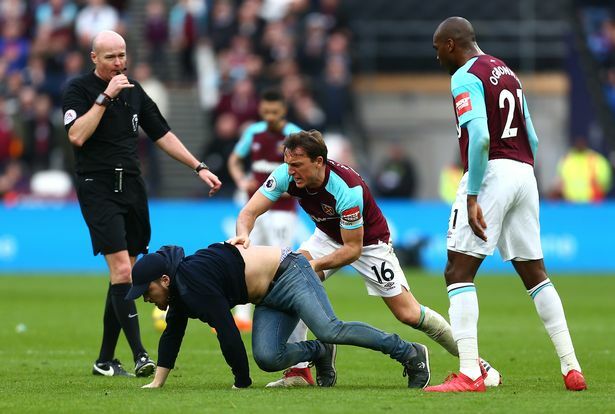 Without stewards to stop them, Mark Noble tried to clear one fan off the field. With the mob coming to life, the team lost focus and only moments later Chris Wood made it 0-2. By this time, fans were attempting to rush the owner’s box, and stewards were breaking up fights all over the ground. By the time Wood scored his 81st minute goal, and it was 0-3, the match was second to the drama in the stands, and wisely, Lee Mason ended it as soon as he could. For the club, West Ham is in uncharted territory. This type of unrest and foolishness is sometimes seen in lower divisions, but rarely at the top flight of English Football, especially in 2018. Whether the board makes changes or “bunkers down” and becomes entrenched against the opposition remains to be seen. As an outsider who doesn’t reside in London, staying up must be the priority. I have no faith that West Ham could be like Newcastle and pull a quick one year break in the Championship and come straight back into the Premier League. With the London Stadium ticket capacity, the Premier League broadcasting revenue, and all the other benefits that West Ham has, going down would be a disaster. Plus all of their non-UK fans would have a very difficult time following them in the second division. West Ham has the talent to find another ten points and stay up. West Ham has a coach that is capable of bringing the side to success. But when the team captain is wrestling with one of his own supporters out on the pitch when they are only down 0-1, that is hard to overcome. The first goal today was poor defending. The second two were due to a collapse of order around the ground. Whether the Hammers could have found an equaliser if the fans had stayed with them, we won’t know, but today a select few supporters helped Burnley get a victory today. West Ham: Hart, Zabaleta, Collins, Ogbonna, Cresswell, Kouyate, Noble, Mario, Lanzini, Antonio, Arnautovic. Burnley: Pope, Lowton, Mee, Tarkowski, Ward, Cork, Hendrick, Westwood, Lennon, Gudmundsson, Barnes.